Happy Friday Potlucking to you! ...you wouldn't even mind another foot or so of snow because it's at least warm enough to go do stuff. Ok, maybe I'm over dramatizing just a bit, but I would be ok with it warming up just a bit. Can't wait to see what you bring this week! 1. Link directly to your recipe (not your main blog). 2. Only one recipe per blog each week. 3. 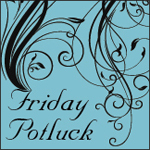 Be sure, in the linked blog post, to link back here to Friday Potluck @ EKat's Kitchen. 4. Have fun, do some visiting and enjoy! If you want to get updates on my posts, and any promotions I'm running, especially with Google Friend Connect going the way of the dodo bird, please follow me either via email or using my RSS feed. Blogs I Love... and you should too! Smoothie Showcase: 10 Smoothie Recipes from the CCN | And enter to #win a Magic Bullet!